A potential recession, along with increasing regulatory threats to some of the largest tech companies, suggests a difficult year for Silicon Valley in 2019. "People are looking for scapegoats in a bad economy A big downturn may well lead to a later date, which could probably lead to arguments that the biggest Internet companies are too big and need to be contained." is poised to end Big Tech's year in Washington, and possible regulatory action will continue until 2019. Google boss Sundar Pichai has agreed to testify before Congress, and will likely be asked if the company is transparent about privacy practices and any prejudices. By the end of the year, the CEOs of Twitter, Google and Facebook will testify for the first time in 2018 before the congress. Legislators in the United States are pushing for a federal privacy law that is likely to face an emergency aggravated by further violations such as those announced by Marriott last Friday. The Federal Trade Commission still has open investigations into whether Facebook's behavior violated a previous settlement with the agency. Margrethe Vestager, Europe's aggressive commissioner overseeing the competition, is still scrutinizing aspects of Google's business and whether Amazon is fair in the generics market. President Trump said his government should seriously investigate the monopolistic behavior of Facebook, Google and Amazon. Some analysts predict that a slowdown – even if it does not lead to a recession like that of 2008 – will be enough to change global attitudes towards big American companies. "This is really shocking This year, America is the only major economy where growth has actually accelerated, and that's because of the tax cuts, deregulation and other impulses that have been put into business revenue My point is that these effects will fade from next year. " The" FAANG "camp (Facebook, Amazon , Apple, Netflix and Google), which have driven the stock market to record highs, have not escaped this year's market route. "Mood has changed and investors are asking a lot more questions now," he says, managing director of Mayfl Ower Advisors, Larry Glazer, who manages $ 3 billion. "Momentum has subsided with these names." Possible concern: Possible regulatory action could lead to higher costs, especially for Google or Facebook. 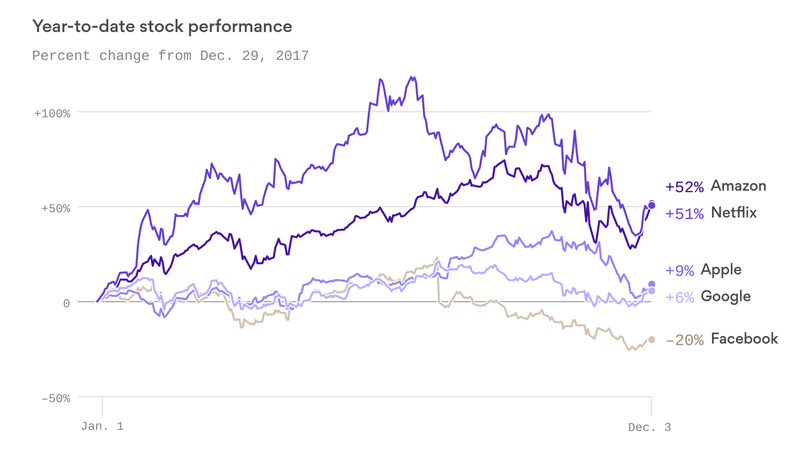 "Facebook has been in a dark cloud for so long that now everyone expects the worst," said Paul Meeks, technology portfolio manager for Wireless Fund, to Axios. The other side: "I do not see a looming recession, and even if, people would not approach these companies when there is a recession," says Nicholas Economides, a professor of economics at the Stern School of Business the NYU. Economides argues that even if GDP growth declined slightly, this would not significantly affect the high-tech sector. Companies like Google, Facebook, and Twitter "have their main sources of income with ads, and they gain market share from brands that convert traditional ad spending into digital ads.This conversion does not depend so much on GDP growth because they are In the process of converting ads of various formats into digital ads, and this will continue regardless of GDP growth. " Bottom line: Tech companies, which have long been the darlings of investor portfolios, are likely to likely find themselves in much weaker positions.